Easter is Sunday, April 5th, 2015. If you would like to wish people a "Happy Easter" or invite people to your Easter celebration at your church, you can use a vinyl banner! There are lots of vinyl banner templates available that you can customize in our online designer. Some of the templates are related to church services. Other templates are related to Easter egg hunts and other Easter events. 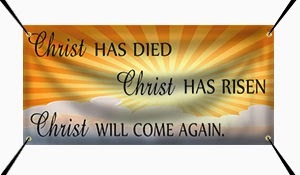 You can visit our Easter banners website to customize on of the templates using our background images, clip art images, and text. You can also upload your own print ready file, or have one of our graphic designers create your Easter banner for you.